One of the problems which arose in interviewing our Special Guests for AMT200 is that those people were witness to our most hideous, embarrassing, shameful years. Worse, they have visual evidence. Enter, if you dare, the Gallery of Munt! Let’s take a quick break from all these words to admire a couple of pictures sent in by two listeners. Lovely work, gentlemen; worthy additions to the AMT Gallery, the rest of which you can see HERE. 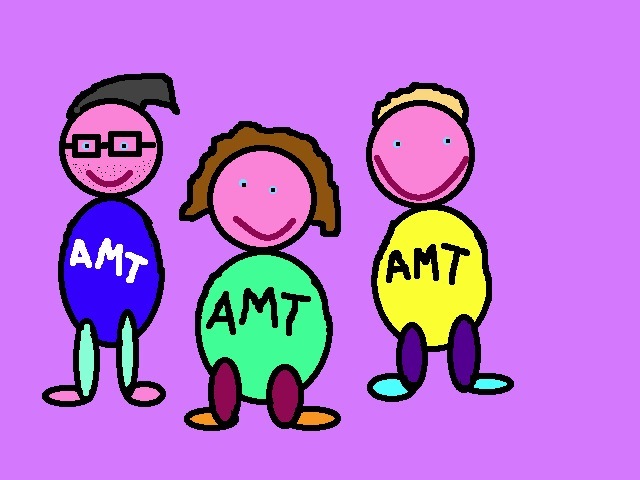 And, if the fancy takes you, send in your own AMT artworks to be hung on our virtual walls! I’m breaking tradition, I’m emailing not with a question, BUT WITH A PRESENT…of sorts. I found myself doodling as I usually do whilst listening to episode 98, and it sort of developed into the drawing that’s attached! It’s to celebrate your 100th episode, and a thanks for being so damned awesome over the last two years. Incidentally, as a birthday treat, we were asked to compile our Celebrity Playlist for iTunes. If you can pause in choking with laughter at the mere notion of us having managed to muscle in on something with ‘celebrity’ in the name, then click HERE check out our joint megamix. 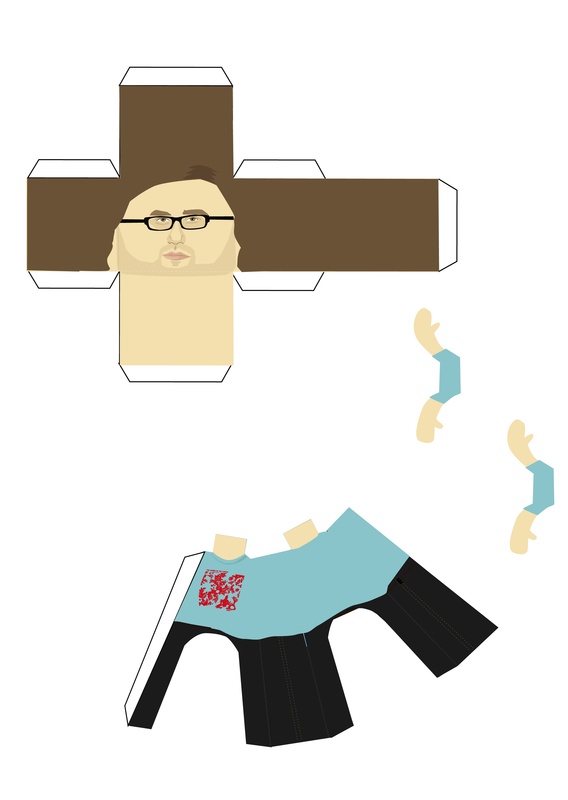 If you want to make your own papery Martin, click on the picture below for the full-size pattern; and do take a look at Sally’s Flickr stream for her other cardboard chaps. We hope you’re enjoying our break – and that you have joined our Facebook Fanclub for the chance to win tickets to our live 100th Episode extravaganza at the iTunes Live Festival. If you have, you will find out all very soon! Meantime, here’s a little holiday treat courtesy of artist Sally Grosart, who makes marvellous paper toys of such entertainment luminaries as the Flaming Lips, New Kids on the Block and AMT!P pals Pappy’s Fun Club. And now us! If you fancy making a little paper Helen and Olly to terrorise your mantelpiece, click on the thumbnail below to download the pattern; and check out Sally’s other fun papery work on her Flickr stream. In response to Laurence from York’s question regarding things being “ice cold”, I must take a slightly tangential and pedantic point that it is possible to water to be liquid at temperatures far below zero due to a phenomenon called “supercooling” (www.en.wikipedia.org/wiki/Supercooling). To illustrate this I have composed the following cartoon. Click on it for a bigger version, and visit www.lukesurl.com for more of Luke’s ace cartooning. 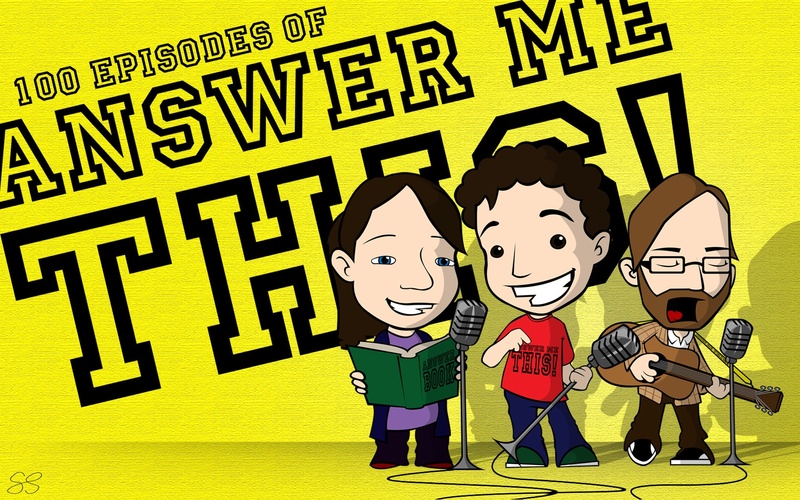 Like proud parents sticking their toddlers’ daubings on the fridge door, we are altogether delighted when you send us your artistic endeavours inspired by Answer Me This!. 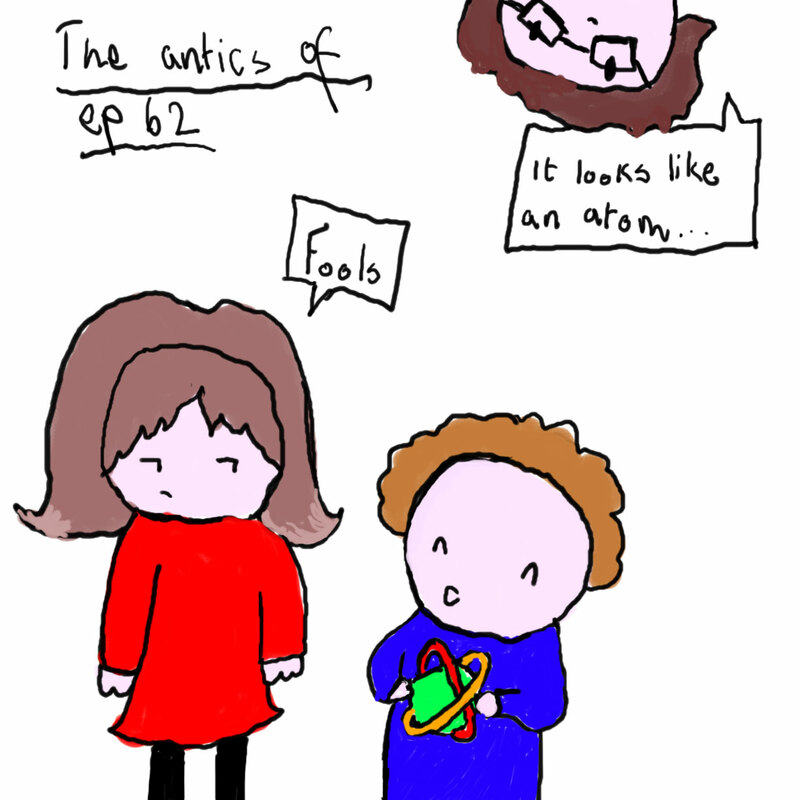 We very much enjoyed this, that and the other, and now Luke from Cambridge has similarly perked up our days, having just made a snippet of the podcast into a cartoon! Visit his website lukesurl.com for the full-size version. Smith where Jones had had had had had had had had had had had the examiner’s approval. That’s eleven ‘had’s in a row! Punctuate them so that the sentence makes sense, goddammit, else Mr Bullard will throw a hardback dictionary at you from beyond the grave. ** Have you entered our CAMCORDER CHALLENGE yet? What does it take to melt our hearts, listeners? Flowers? Puppies? Sulphuric acid? 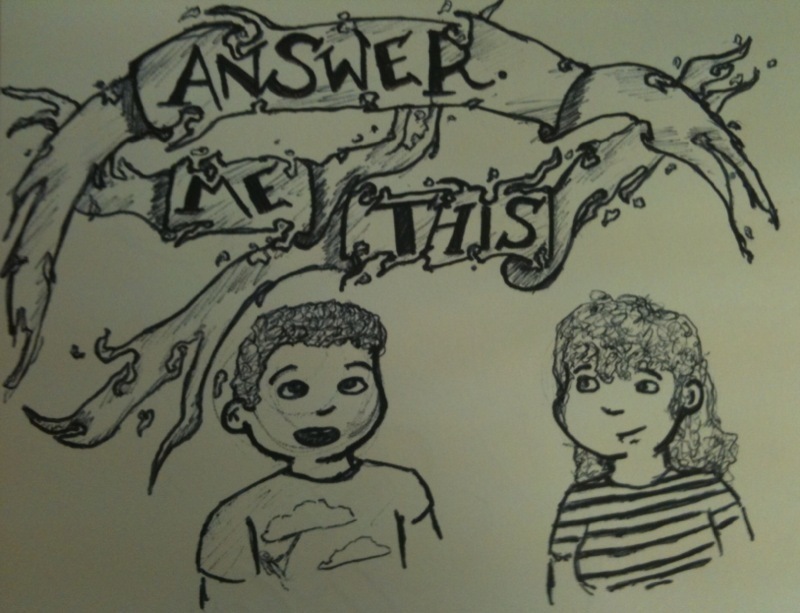 I was just listening to some old episodes and was inspired to create this…well either that or I was just really bored. Thank you, Amelia! Especially for giving us all such nice hair. Oh listeners, we do love it when you send us things. Questions, that’s a given. Pictures, a rare but great delight. And now animator Weles Bussett has gone and turned the pretitles from Episode 45 into a piece of animation for the dialogue* section of his portfolio! Loooooook!!! I only wish we were that charming, moving and toned in real life. *if the speech looks a bit out of sync, it’s not Weles’s fault – Youtube likes to jigger about with that sort of thing, just in case you forget who’s boss. As I listen to your podcast my mind makes up images of what the place you record in looks like. I decided to sketch out what I picture in my head. 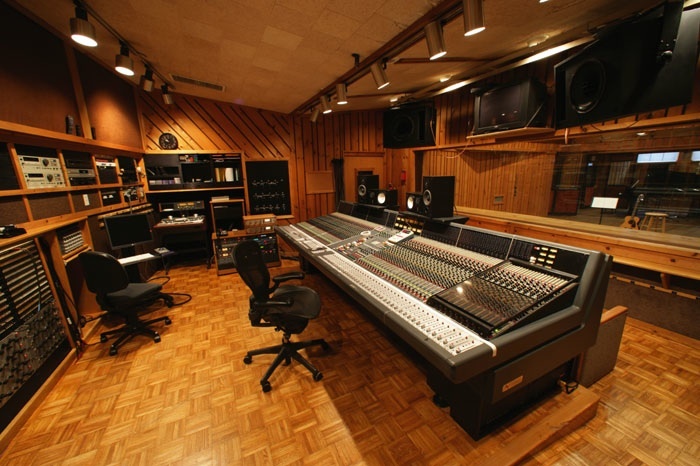 I have no idea if I’m right, though…what if your “recording studio” is really an old rec room or someone’s bedroom? What if you’re all just sitting around on a bed leaning over to share a computer microphone? I much prefer to picture you in a professional-type studio with fancy microphones, a laptop for quick research, and Martin in his own fancy sound booth. So Helen and Ollie, answer me this, what does your recording studio look like? 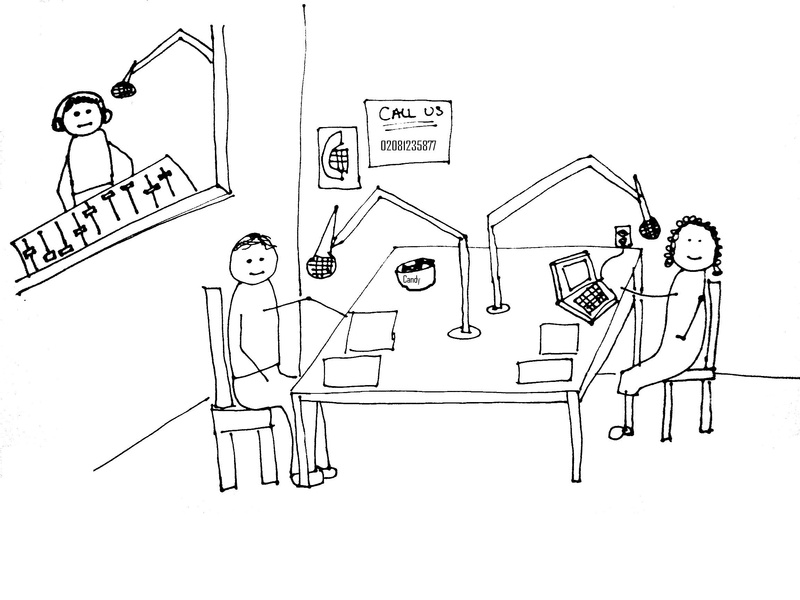 Oh, ok – our studio isn’t quite as snazzy as that one, but let’s keep Alison’s dream alive a little longer… Meanwhile, before we reveal the prosaic reality of Where The Magic Happens, if any of the rest of you feel like sending us a picture of what you think the studio looks like, we’d be quite delighted. Please email it to answermethispodcast@googlemail.com, and we’ll post it up here, just like Tony Hart might have done if he hadn’t retired.